My office is on the upper deck of Hangar One at Ft. Wainwright. A historic building, ONCE the largest man-made structure in Alaska, built in 1940 during the Russian Lend/Lease program. My window looks out over Ladd Field toward the Alaska Range. I find the sounds of the planes and heckalopters very soothing. People who move in next to existing airports and then complain about the noise are idiots. Fortunately, almost everyone I know around here is a fan of Aviation....civilian or otherwise. KK4NSF, K5TCJ, WD5IKX and 1 other person like this. I have to agree with you. Sold our home and moved aboard our boat about 8 months ago. Now living in the San Juan Islands in NW Washington. Since we are in the islands, most everything comes and goes via air. Almost every island has an airstrip and there are many bays and coves that are perfect for float planes. My GRE-600 scanner runs most all day. Now beginning to be summer, there is a lot of air activity that I enjoy listening to. We are also not too far away from NAS Whidbey so there is a fair amount military air activity. I also listen in on the Boeing photo flights where a chase jet takes photos and videos of new Boeing planes that are nearly ready to ship to their respective customers. Mt. Baker is a favorite backdrop when Mt. Rainier is clouded over. Also hear the USCG helo's and C-130's. Since I am just a few miles from the Canadian border you can often hear the CBP's Blackhawk choppers on patrol. As if that weren't enough, there is an awful lot of marine traffic. The scanner is rarely quiet here. Lots of fun! When I retire, I'll move onto my personal Viking ship. However, I'll need something resembling a body of water...which probably excludes Fairbanks. Oh I suppose I could sail my Viking ship up the Chena River...but something would be lost in the translation. By the way, I love the San Juan Islands. We used to take the ferry up through there when we lived on Mercer Island. eople who move in next to existing airports and then complain about the noise are idiots. I've always been a fan of aviation. I monitor aviation frequencies, and always thought it would be cool to live near an airport. When we bought our house, neither the realtor nor the previous owners told us there was a military airport on the other side of the tree line. Turns out our street is exactly parallel with the runway, and pilots use it as a visual cue on approach. 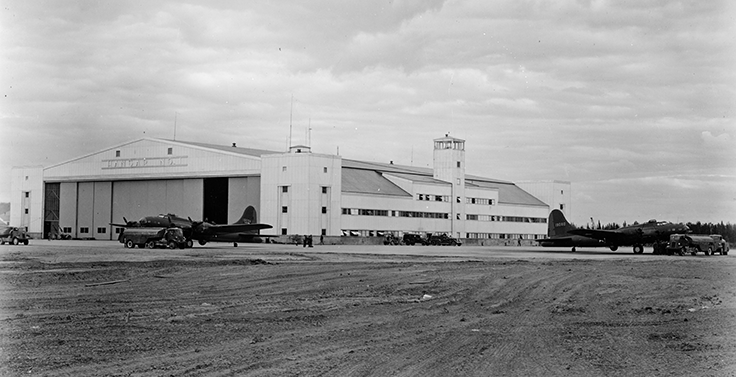 At the time the airport was used by public charter companies and the military to maintain c-130s. If you know the C-130, you know it's slow and loud, and they fly over my backyard so low that I began to recognize the test pilot, and they would wave to me through the downward-looking window. That was the cool part. You see, the military works 24x7....they don't fly 24x7, but they work on the aircraft. At night, we can frequently hear them 'running up' a C-130 on the runway. But back then there really wasn't that much traffic. We bought a house without knowng about the airport. Fast forward to a few years back. In addition to maintaining C-130s, military helicopters and their crews were moved there. When I say helicopters, I don't mean channel 5 news helicopters, or the helicopters they use to give people tours of Alaska, I mean CH-47s and CH-53s, the heavy-lift helicopters and troop transporters. They're loud, and they fly below 100ft on approach. They actually DO fly 24x7, because the crews are training. Night time practice missions are common. Pilots practice heavy lifting by carrying loads of cement blocks suspended below the aircraft by a cable. AND, since these guys use the runway to land, they fly directly over our house. Frequently. It's like living next to train tracks. But, I am not complaining about the noise, because I don't even hear it anymore. I only notice when an aircraft gets close enough to rattle the window panes....several times a day. Air traffic has increased over the years, is considered a nuisance and affects the value of my property. So, before calling someone an idiot, maybe you should consider that WORKING next to an airport is nothing like LIVING next to an airport. It's hard to truly understand the size from a photo. Not quite as big as Moffett Field Hangar One...but still impressive. Still have ghosts of Russian pilots haunting the place.